We begin this candle with a layer of our yummy Peanut Butter Cookie fragrance, we then add a layer of our hand whipped wax in the same scent. Next we top it off with peanut butter cookie wax embeds and sprinkle it with sprinkles. 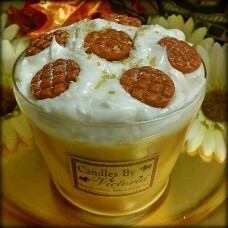 Amazingly good, if you love Peanut Butter cookies right out of the oven this candle is for you!